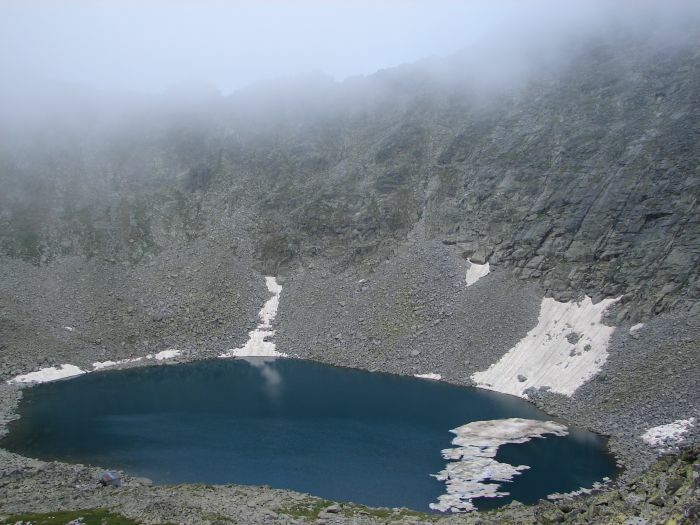 Rila is the highest mountain range of the Balkan Peninsula, located in the west-southern part of Bulgaria. 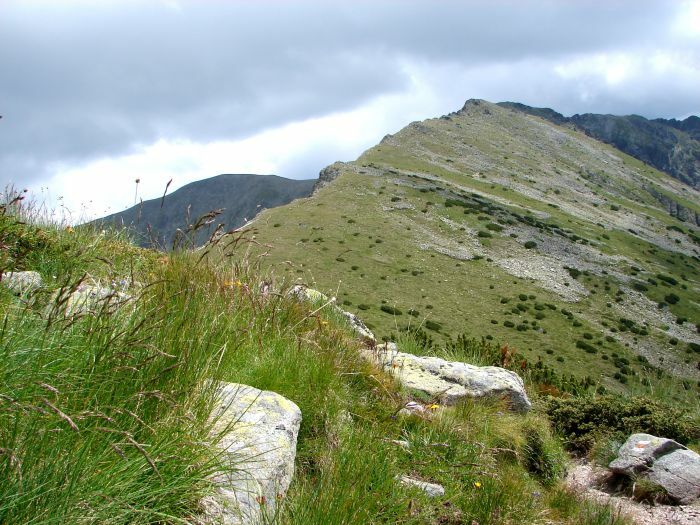 This massif has 19 peaks over 2600 meters above sea level, with the highest one - Musala (2925 meters AMSL according to the maps). 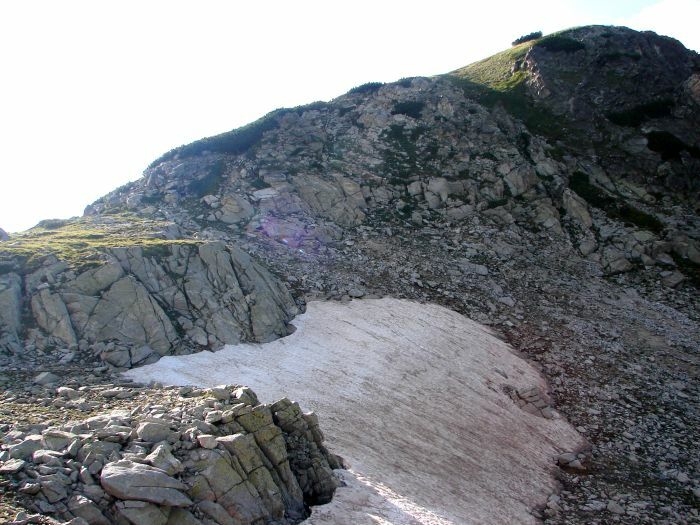 It is interesting that Musala "is growing" and in 2005 the height of the peak was 2971 meters AMSL (at the peak there is a board with information). 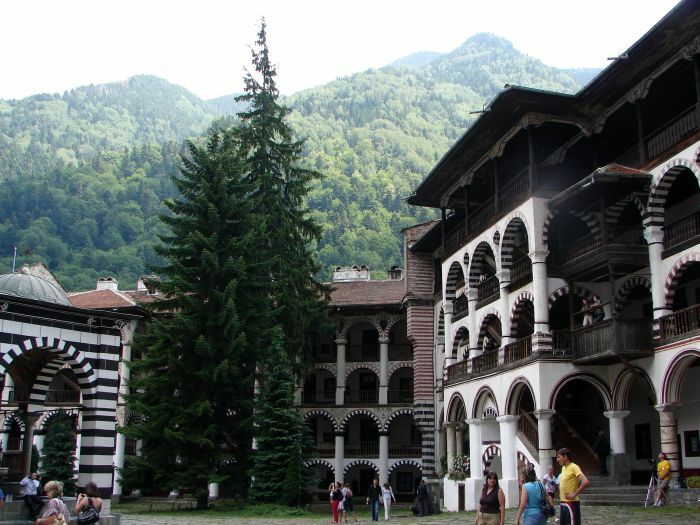 1st day: Borovec – Jastrebec hostel - Musala hostel - Ledenoto Ezero hostel - Musala peak. 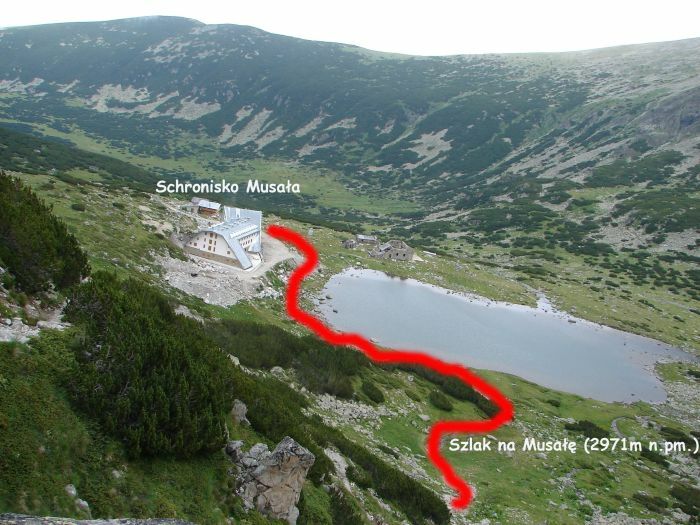 duration: about 3.30 hour - from Jastrebec hostel to the Musala peak (without time of entry by cable car, or climb from Borovec to the Jastrebec - approx. 4 hours). The route starts lazily - from entry by cable car from the station Borovec to the station Jastrebec (Cost is 10 lewa which means about 5 Eur, on Mondays and Tuesdays cable car doesn't run, however it is worth to use it because it saves time and energy, for those who want to hike: trail leads through forest, and it is long and arduous). From Jastrebec hostel our entire route runs along the red marked route. After about 1 hour we reach the beautifully situated Musala hostel. There are about 2 hours to the next hostel Ledenoto Ezero from here. The trail is quite steep but without any technical difficulties. 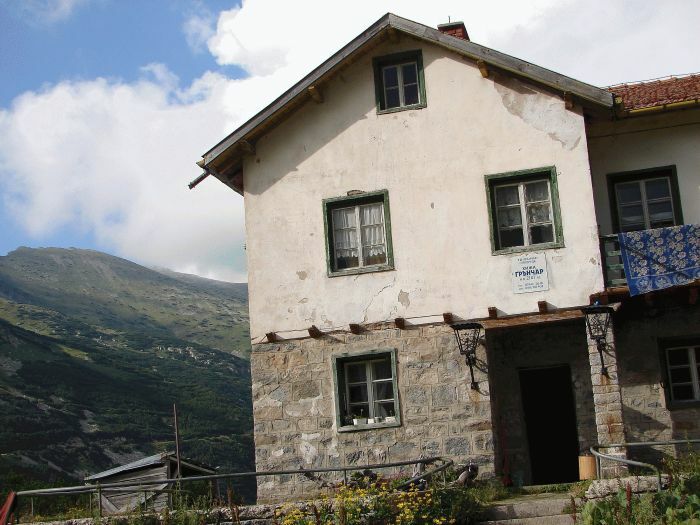 Ledenoto (located on the shore of the lake) is a high mountain hostel - there is a very friendly atmosphere, you can eat something and drink mulled wine. What is interesting, even in the summer, on the Ledenoto lake can be found ice cover. 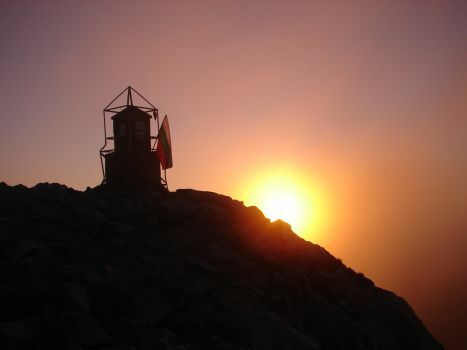 The last stage of the journey is less than one hour, not difficult climb to the highest peak of the Balkans - Musala. 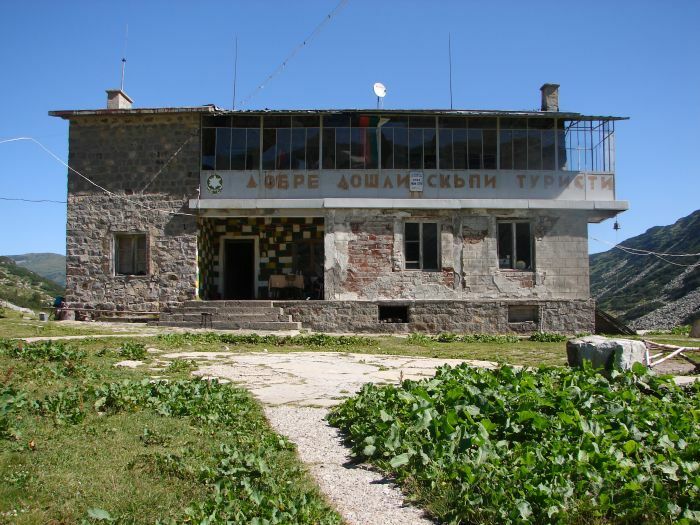 At the top is a meteorological station and a shelter (which in practice looks like modest hostel - you can buy snacks, beer and even hot tea). Accommodation costs 15 - 20 lewa ( 8-10 Eur ), depending on the tourists negotiating skills. 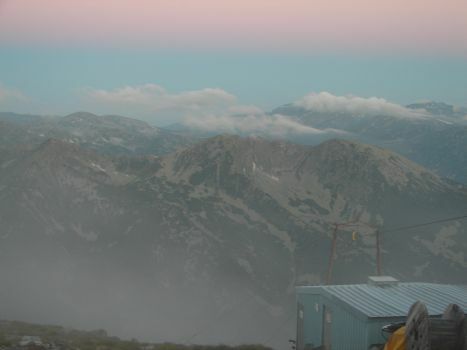 From Musala You have great views on the Rila, and with good visibility also Pirin. 2nd day: Musala peak - Malyk Bliznak - Goljam Bliznak - Mariszki Wrych - Owczarec - Dzanka pass - Grynczar hostel duration: about 4 hours (but because of the wonderful views on the way, I'd advise to plan more time for this route). The route starts from the shelter on Musala peak. We're going few meters in the direction of blue coloured building (it seems that it is a building of a weather station, but I'm not sure). We walk round the building from the right side and follow the red marked route, which will lead us to the Dzanka pass (in about 3 hours). At the beginning about half an hour we go down slightly, then cover peaks Malyk Bliznak (2777 meters AMSL) - Goljam Bliznak (2779 meters AMSL) - Mariszki Wrych (2765 meters AMSL) - Owczarec (2768 meters AMSL). The route hasn't any technical difficulties. Sometimes it looks like landscape of the Bieszczady (mountains in south-east Poland) meadows. 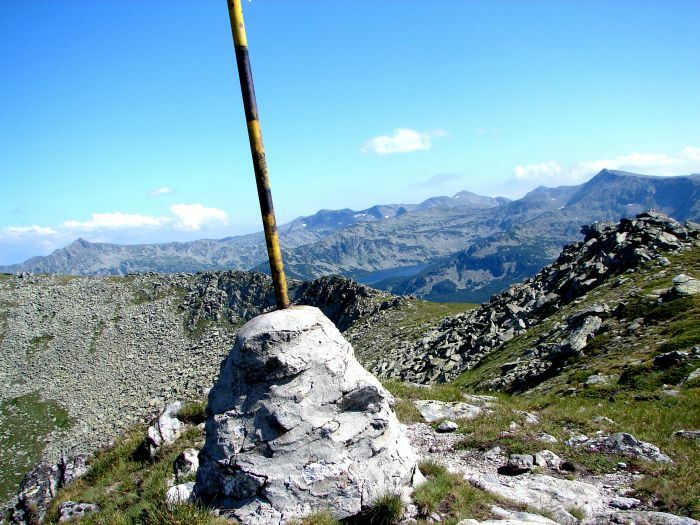 From the Dzanka pass to the Grynczar hostel (2187 meters AMSL) we follow the blue marked route about 30-40 minutes. This last part of our trail leads down among the dwarf mountain pines. In the guidebooks and maps, I found two translations: Grynczar and Granczar. The first seems to be more correct (although I'm not the Bulgarian linguist) because the original spelling after the "r" is so called "hard character", which is not pronounced, but You can hear the reverb in the style of the letter "y". Condition of the hostel, just like the nearby bungalows is not delightful. Accommodation costs 10 lewa (5 Eur). Buffet is also poor - perhaps we encounter such bad situation, but we could buy only nameless soup. Well, for the first time in my life I ate "tasteless" soup, it was something like a mixture of: vegetables with noodles from instant soup, boiled on water with oli, completely not seasoned. 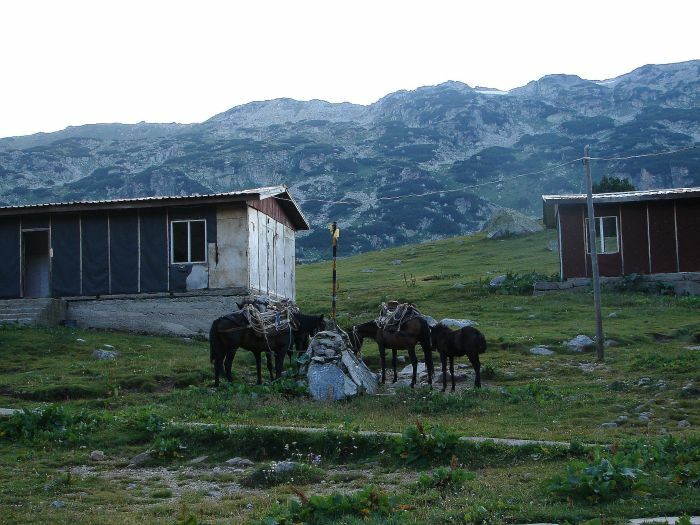 However, all inconveniences are compensated by picturesque location of the hostel on the shore of the Grynczar lake in front of dry Wapa peak (2638 meters AMSL) and the kindness of the landlords (a couple of retired teachers). 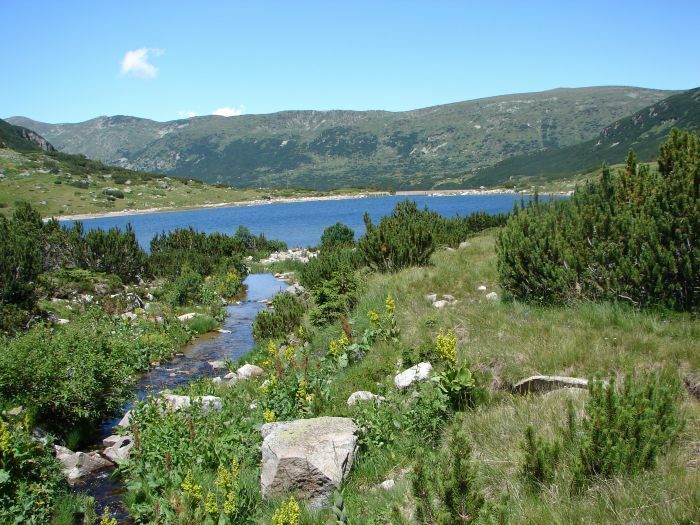 3rd day: Grynczar hostel - Dżanka pass - Kowacz peak - Łopatiszki Wrych peak - Gorni Kuki pass - Wapa peak - Kanarski Presłap pass - Ribni Ezera hostel duration: about 7 hours - from Dżanka pass, we have to follow red signed route all time. In comparison to the previous day, today's route is quite long. 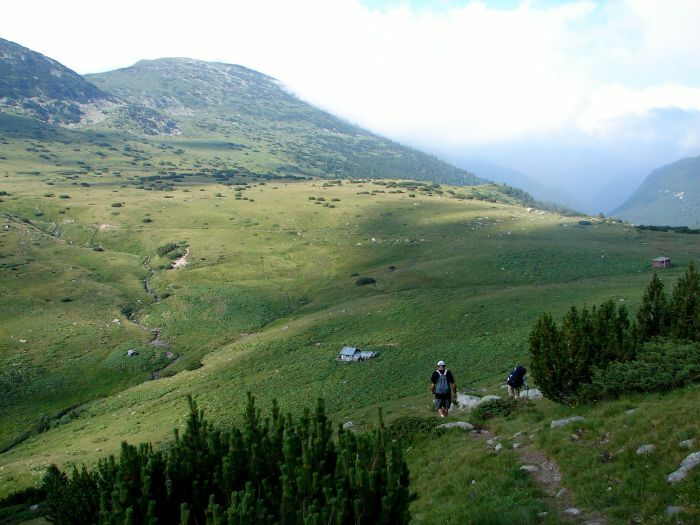 Generally leads a broad grassy ridge, and in the last part before Kanarski Presłap pass is quite steep. We start from reaching Dzanka pass, we follow the well known from previous day blue marked route. 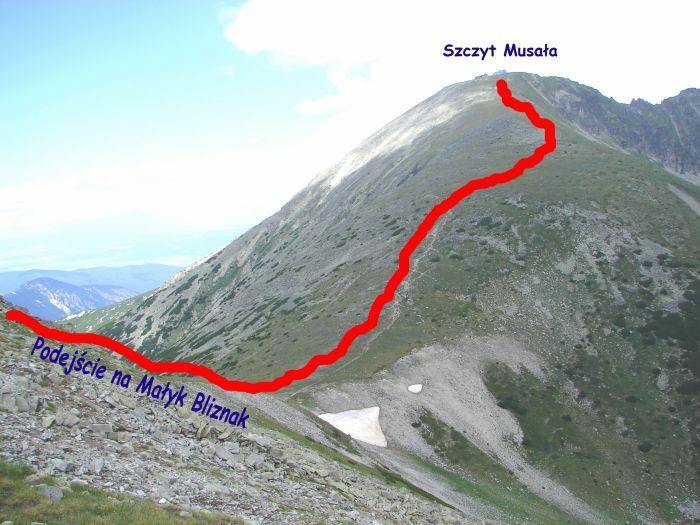 From the pass up to the Rybni Ezera we have to hike the red marked trail. 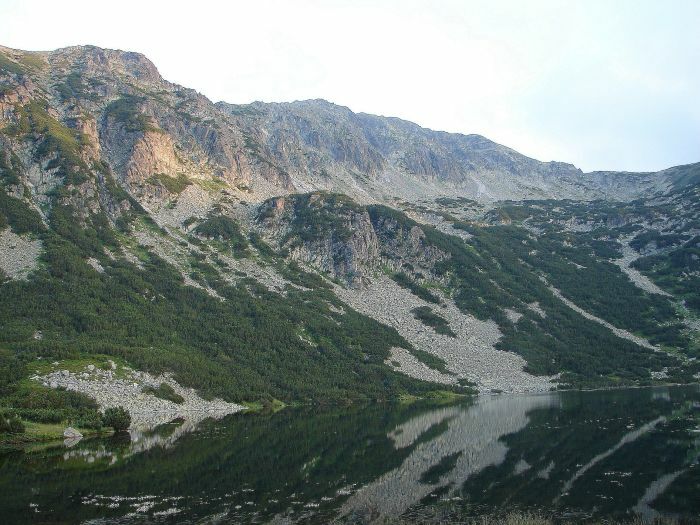 You easily climb peaks Kowacz (2634 meters AMSL) and Łopatiszki Wrych (2530 meters AMSL). After more than 4 hours from leaving the hostel, we reach the Gorni Kuki pass. 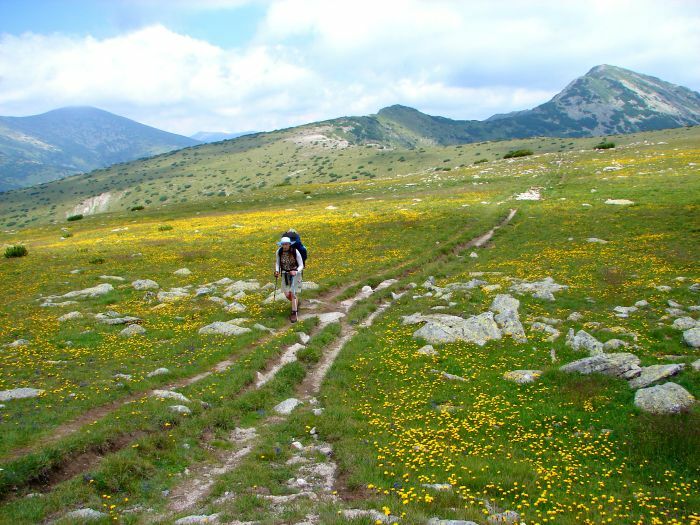 Actually, Gorni Kuki, although it is called pass, is a huge, blossomed mountain pasture. From here we have about 2.30 hours left to the next pass - Kanarski Preslap. This part of the route, after ascent of Wapa (2532 meters ASML) is quite steep (without big technical difficulties, but you need to be more careful). From the Kanarski Preslap, we can see Rybni Ezera hostel. To reach Rybni we have to go down the zigzag path about 0.30 hour. Rybni Ezera hostel is a very "special" place. At the crumbled building, with broken windows proudly waving a Bulgarian flag. Inside, as it is usual in hostels, is a dining room, but the bar is closed (at the same time You can hear a few people in the kitchen). Menu and price list are missing. On the whole nobody knows where to ask for an accomodation. I knocked every doors inside, and in such way I found hostel staff. 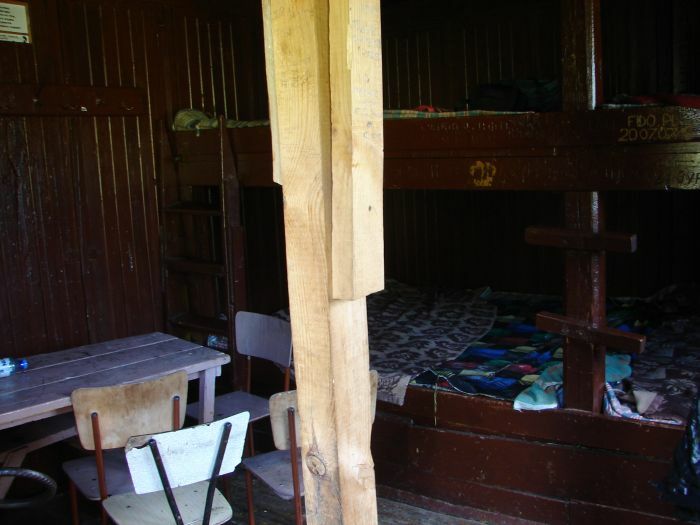 A night in such "luxurious conditions" like bungalows costs 15 lewa (about 8 Eur). This is quite expensive, but staff didn't understand neither English nor Russian, so there was no sense to haggle. The next day at 9.30 on the stairs of our bungalow was sitting a woman with the mop, ready to turn us out of the bungalow (check-out is until 10.00 a.m.) because she had to "clean up". The joke is that maybe 10% of all beds were occupied, and besides, there was nothing to clean up there ... "Suite" has two plank beds and the floor covered with linoleum. 4th day: Rybni Ezera hostel - Wodni Wrych (2683 m.n.p.m.) - Kobilino Braniszte pass - Kiriłowa Poljana (a small village) duration: about: 6.15 hour. 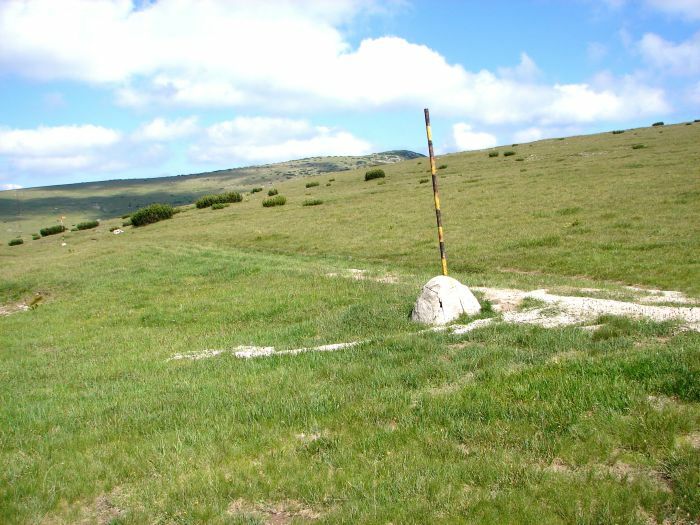 To Kobilino Braniszte pass red marked route and after the green one. 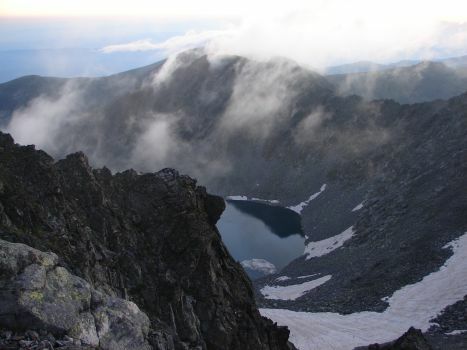 The route is technically easy, but requires a little effort during approach Wodni Wrych due to the fairly large difference in altitude: Rybni Ezera is 2250 meters A.M.S.L and Wodni Wrych peak 2683 meters A.M.S.L what means 433 meters difference. Actually, even more, because starting at the beginning of Rybni Ezera route goes down. We start from the red marked route, looking from the front at the Rybni Ezera hostel, we round it at the right side. but our route goes further. On the left side looking from the front of shelter You should find green marked route, which will lead You to Kirilova Poljana in about 2 hours. Kirilova Poljana is a small village, where you can easily find accomodation and something to eat. the train - also personally checked, the way is through Slovakia, Hungary and Serbia. I advise You against buying a ticket in Poland because of the crazy price (about 1000 zł in one direction, sic! means 250 Eur). But in neighboring countries, including Slovakia, you can buy such a wonderful "invention", as so called City Star ticket. The essence of this ticket is that the first person pays 100% of the price and each of the next half price (max. 5 people per ticket). 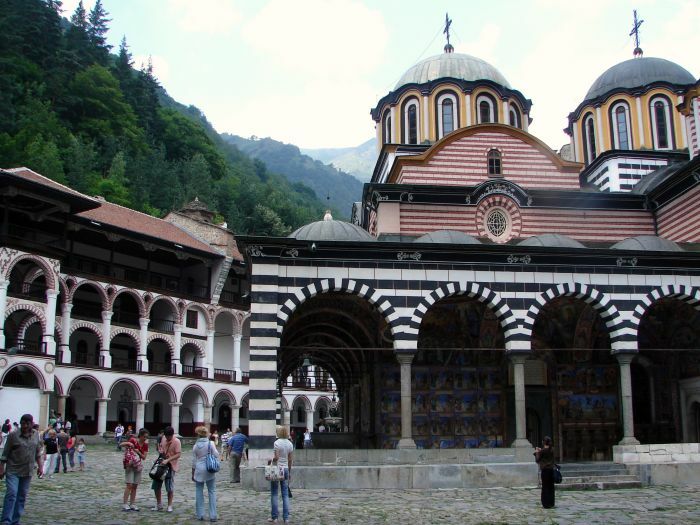 We, means - 2 people, paid 153 Eur for round-trip, from Slovak city Zilina to the Serbian-Bulgarian border. So about 300 zł (75 Eur) per person for round-trip. I think that it is quite cheap. Of course, you need to add journey to Slovakia, we crossed the board by walk :) in Zwardoń (Poland) and in Skalite (Slovakia) bought a ticket to Zilina for approximately 2€ per person. There is one more question left - how to cross the Serbian - Bulgarian boarder. Unfortunately, City Star tickets can be purchased only on specific routes - but don't worry, You can make an additional payment in the train. I did so, and the conductor took from us only 5 Eur. What is more, when we were leaving he said to us: "Poland is not dead yet" (these are words from Polish national anthem :) ). Transfers in the following cities: Bratislava, Budapest Train Kaleti, Belgrade. For more information on ticket City Star on Slovak railways: http://www.slovakrail.sk (Unfortunately only in Slovak). 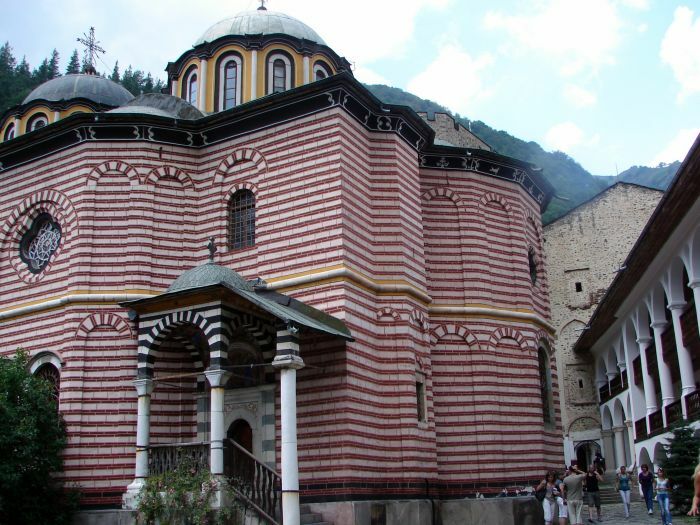 From Sofia you can get to various villages / towns near the Rila mountains. 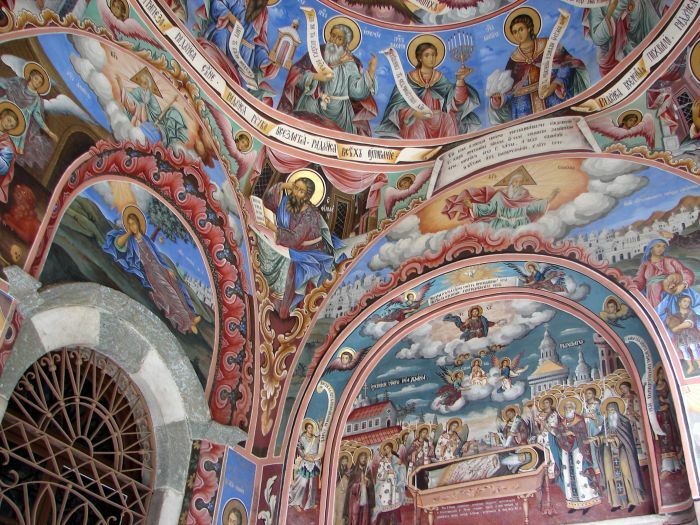 We stood on first night in Samokov (less than an hour drive from Sofia). 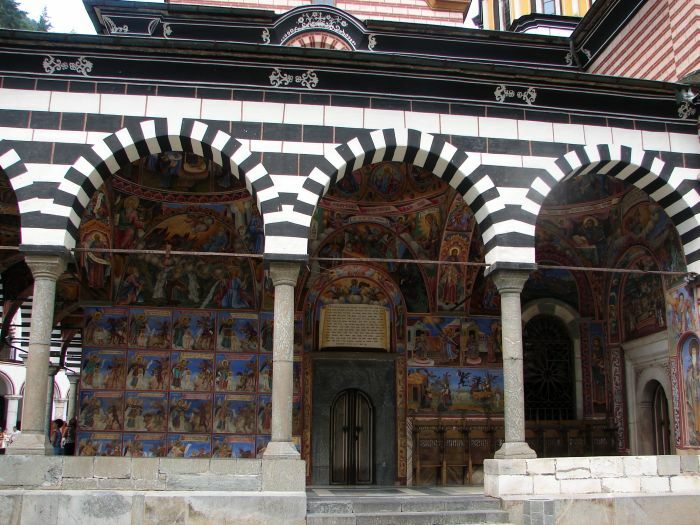 Samokov is relatively big town, and from here to the mountain resort Boroviec is only about 10 km. 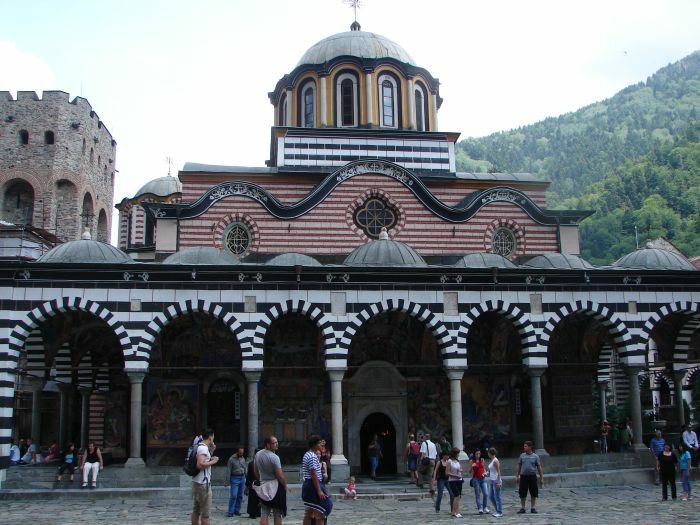 Important notice: from Sofia to Samokov (and Borovec) buses depart from South Bus Station (only!). To get there from the railway station the easiest way is to use the subway. Reservations can be made by mail. 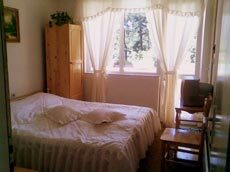 Prices are reasonable (there is a lot of promotions), rooms have shower and toilet, to the center of Samokov is approximately 15 minutes by walk.